There are many models out there that have raised parts embossed on a single plastic piece instead of multiple pieces. 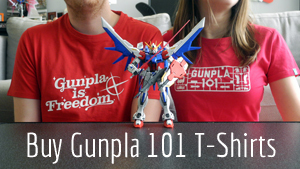 On Gunpla kits, these tend to be Zeon-origin models and the pieces in question are usually on the chest and wrists. These kinds of parts would be very tedious to hand paint without lots of masking and have very little room for error. Thankfully, because of the natural properties of paint, we can easily get the effect we want with little effort. Enter the Reverse Wash Technique! We will be taking advantages of how different types of paint react to each other, but if you would like more of an explanation on the different paint types and how each reacts to each other, read our Paint Types 101 article. Your embossed part, pre-primed (learn how to prime Gunpla here). I used Vallejo Gloss black primer. LOTS of cotton swabs and paper towels! *The raised parts paint can be either acrylic or lacquer-based. As stated before, the reasoning is explained in more detail in our Paint Types tutorial. This method is best used with an airbrush, which is what I used, but a similar effect can be achieved with spray paint, just as long as you use the specified paint types. For this example, I will be using the MG Sinanju. Note the black-and-gold detailing on some of the accent pieces. It comes with black-and-gold stickers to make this effect happen, but I want to use custom red-and-gold coloring instead. That’s why I’m using the Reverse Wash Technique. After you prime your part, the first step is to paint the entire piece with your accent color, the color you want to sit on the raised ridges of the part only. As you can see here, I have painted the entire part a metallic chrome. It’s OK if it doesn’t cover everything so long as the raised parts are colored. After the paint dries, put on your gloss top coat to seal it in. Yes, I really do use Pledge, the floor cleaner, as a Gunpla gloss coat, and it works beautifully for half the price of a hobby gloss! Once your gloss top coat has finished drying, it’s time to apply the enamel base color. In this case, I am using dark red paint to cover the entire part. Make sure everything gets covered in this paint and let it dry for up to four hours, as enamel paint takes longer to dry than acrylic or lacquer. Now, and I can’t stress this enough, rub the part gently with the cotton swab. As you do, youll see the enamel paint come right off. But it’s important to be gentle! You do not want to take the accent paint off along with the more easily removed enamel. Don’t be afraid to switch cotton buds. Just to be safe, I tend to use 8-15 swabs depending on the size of the part. Clean up any excess fluid with dry cotton swabs and finish by putting on a final top coat. If you mess up and pull off too much, don’t worry! You can see in the top image that I didn’t quite nail the removal the first time, but that didn’t mean it was over. This can be fixed by dry brushing on the color you want and repeating the same steps. Be patient, and your part will look amazing! Milky can be reached at her Tumblr and Instagram.